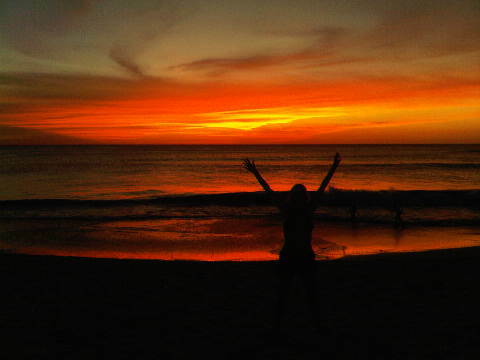 Costa Rica Day 6: Finale! The final day of my maiden trip to the lush country of Costa Rica was mostly about relaxing and getting the final “fix” of everything you love about a place when you know it’s time to go home. I kicked off the morning with a big cup of Costa Rican Java (although I don’t drink coffee..just lattes…I knew I couldn’t leave a coffee country without having a cup) in a beautiful pottery mug made by the locals. In addition to creating beautiful wood items, the pottery in Costa Rica is also very nice! Next I took a walk around the grounds and enjoyed the mild, sunny morning. The foliage, plants, flowers, etc. that thrive in the tropics is so varied and plentiful it makes one a bit jealous coming from Houston where I personally think we can only grow a limited amount of plants and everyone seems to have the same things (I’m speaking of what we can grow with little effort, not what can be sustained with lots of gardening and attention). It’s kind of the same thing I feel when traveling to the Northeast in the summer and see the hydrangeas growing like weeds and tons of hostas, lillies, asian grasses, etc. that are in full bloom and I wish we could do the same in Houston…then I remember we don’t have to shovel ourselves out of the driveway in January either. Along the path I find this beautiful guy (see pic below) just hanging out under a tree. 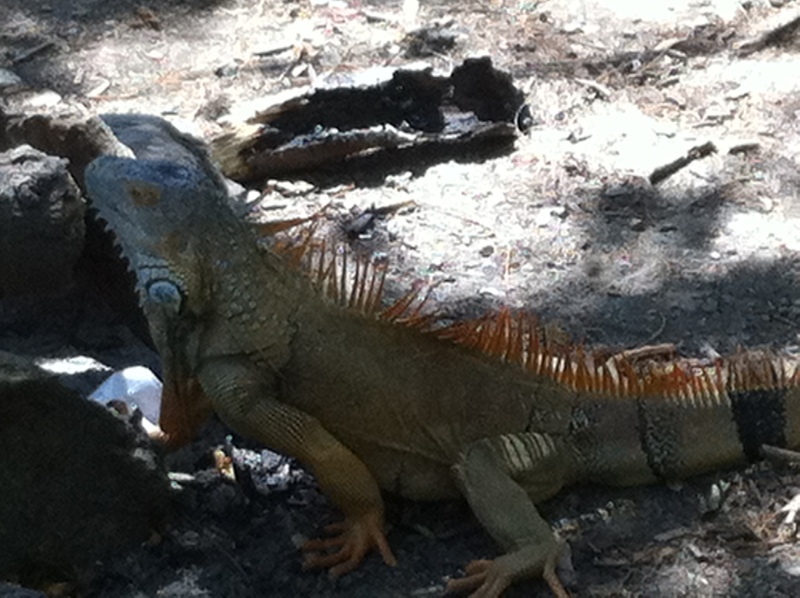 Now that’s an iguana! The iguanas I saw the first few days were small, grey and not particularly nice looking. 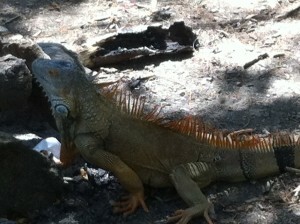 They may even be large lizards and not iguanas but this spiny-backed reptile is the real deal. Their ability to change colors and camaflouge is so interesting. As you can see, he has been told that the color of 2012 as declared by the Pantone Color Institute is “Tangerine Tango” or maybe he read the Jan/Feb issue of PetTalk but either way, he in style this year! Next a final dip in the infinity pool. The view of the ocean down below from an infinity pool is truly a site you can never get tired of. And, you can really get used to being served an afternoon cocktail by the pool which is exactly what I did. A Caipirinha…mmm! My final meal was a fantastic tribute to the tropics…Mahi Mahi with mango salsa, rice/beans, grilled vegetables (no idea what they were but they tasted great), a glass of Argentinean Chardonnay. Of course no gastric gala would be complete without dessert…mouth watering Key Lime Pie. Costa Rica has many wonderful things…nice people, good food, abundant and varied wildlife, great knowledge of using their land in natural ways to create products or environmental improvements, etc. 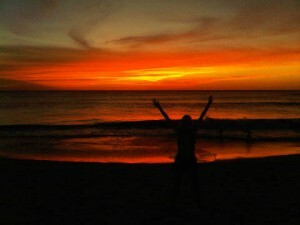 but to me, the creme de la creme is the sunset and as you can see from the featured photo above of me in my good-bye wave, the final evening sunset did not disappoint! See you back in Houston where I will get to work on the March issue so be sure to pick up a copy for more photos from my trip….hasta luego!